This story is part of a monthlong series of guests posts by AIA New York that feature Archtober Building of the Day tours. See the full 2017 schedule here. On Monday, Archtober toured the renovated George Washington Bridge Bus Station. During our tour, Robert Eisenstat, FAIA, Chief Architect of the Port Authority of New York and New Jersey (PANYNJ), and Robert Davidson, FAIA, Senior Vice President and Aviation and Multimodal Practice Lead at STV, described the design and renovation process for the project. 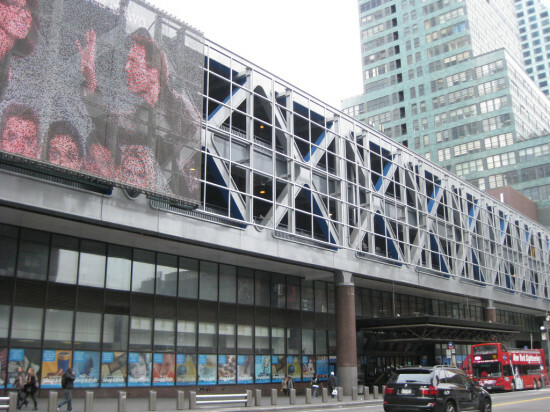 The bus station vastly simplified access to buses and subway, creating commercial space to serve as both a source of revenue for PANYNJ and a new focal point for the community. The renovation project began around 2004, when PANYNJ was casting around for revenue streams in the wake of 9/11. A key aim of this initiative was to open retail space throughout PANYNJ’s properties. At the same time, the George Washington Bus Terminal needed considerable revamping. Every two platforms had a separate stair running up from the ground level, creating both a logistical nightmare and an accessibility violation. There wasn’t enough room to put in ramps or an elevator for multiple staircases. PANYNJ architects had long been drawing up plans for an integrated bus concourse from which all platforms would be accessible. This, combined with the need for rental space, became the impetus for the redevelopment. The project officially began once PANYNJ and STV convinced a developer to take on the project in exchange for revenue from renting the business spaces in the late aughts. 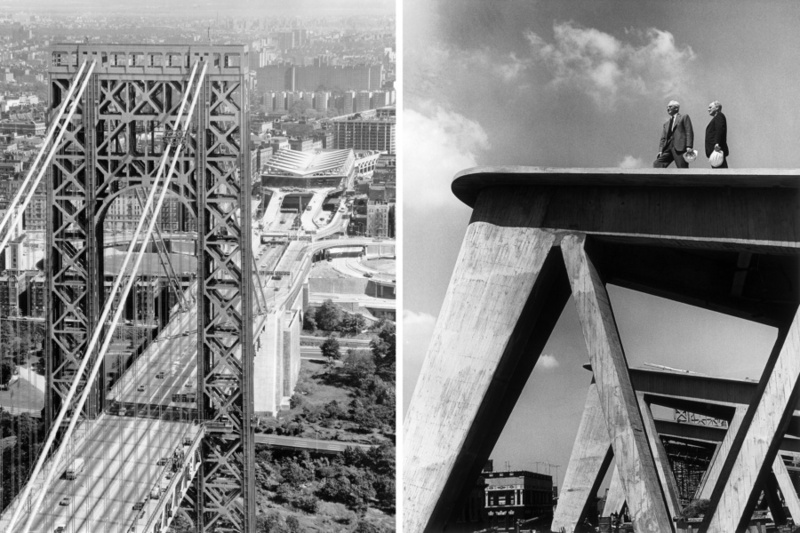 The George Washington Bridge Bus Station was originally a PANYNJ project planned in conjunction with one of Robert Moses’s immense infrastructure projects. It sits over the Trans-Manhattan Expressway, which connects the George Washington Bridge across the Hudson with the Alexander Hamilton Bridge on the Harlem River. The Bus Terminal was designed by Italian architect and engineer Pier Luigi Nervi, a pioneer of reinforced-concrete construction whose other notable works include numerous sports stadia in his native Italy. As Eisenstat and Davidson stated, although the building is not officially landmarked, they treated it as if it was and even collaborated with the NYC Landmarks Preservation Commission on the project. A thorough analysis of the building’s use guided the design of the renovation. The proposal consolidated all bus gates into one centrally accessible expanse, eliminating redundant stairs. It also concentrated all bus activity on the top (third) level, leaving the ground level open for commercial use. This retail space focuses on the “Broadway corridor,” which the designers and developer identified as the main way the bus terminal could serve the surrounding community. The set of stores is known as the "GWB Market | Mercado," as new lettering proclaims. These stores, which include a sorely needed supermarket just off Broadway, are almost all rented and will, once fully occupied, create a new hub of activity to ensure that the terminal serves local users as well as those in transit. The ground floor is now a clean, large space where escalators and a stair lead to the bus concourse above. When visitors arrive at the top of the stairs, they can see the parked buses and, past one of Nervi’s columns, catch a glimpse of the George Washington Bridge. PANYNJ and STV managed to imbue clarity and simplicity into Nervi’s extraordinary structure, turning a somewhat forbidding and empty structure into a pleasing and welcoming space serving both those on the move and the local community. Tuesday's tour of The Hills at Governors Island had to be cancelled due to inclement weather. Join us on Wednesday at Bronx River House. The Port Authority of New York and New Jersey has announced five finalists teams in its competition to design a new bus terminal in New York City. The finalists are: Arcadis of New York, Archilier Architecture Consortium, Hudson Terminal Center Collaborative, Pelli Clarke Pelli Architects, and Perkins Eastman. The Port Authority Bus Terminal International Design + Deliverability Competition solicits conceptual plans for a bus terminal on Manhattan's west side that would replace the 65-year-old dreaded pit of doom that commuters must traverse to get out of and into the city from New Jersey and elsewhere. The competition is part of a master plan that rethinks both the terminal and its surroundings. The redesigned terminal will accommodate an expected increase in passenger flows. Today, the terminal accommodates 7,000 buses and 220,000 passenger trips each weekday. In 25 years, the Port Authority estimates that ridership is expected to increase 35 to 51 percent 2040. The agency's Trans-Hudson Commuting Capacity Study, as well as input from riders, neighbors, and area community groups, will guide concept designs. In Phase one of the competition, the agency sought out "design-led" teams with expertise in engineering and architecture, transportation planning, financing, and land use. The current phase, Phase two, culled the best submissions from phase one for a round of refinement towards a deliverable conceptual design and method for bringing the concept to action. Each finalist submitted detailed multimedia presentations to introduce their concepts. Arcadis of New York's entry, below, positions the terminal over Dyer Avenue, and shows a sleek, light-filled atrium edged with green. The team includes ARCADIS, Sam Schwartz Transportation Consultants, Benthem Crouwel Architects, and CallisonRTKL, among others. https://youtu.be/7jz5LEOTZUo Archilier Architecture Consortium proposes a four-million-square-foot terminal topped with a 9.8-acre rooftop park and rounded out by a 33,000-square-foot plaza on Eighth Avenue: https://www.youtube.com/watch?v=XIT6rx6rNnE Hudson Terminal Center Collaborative is comprised of STV AECOM, SOM, McMillen Jacobs (MMJ), Mueser Rutledge Consulting Engineers (MRCE), CBRE, CIBC, James Lima Planning + Development, and Duke Geological Laboratory. https://www.youtube.com/watch?v=k9eFIOsz-XA Pelli Clarke Pelli Architects' team includes BuroHappold and WXY among its 16 collaborators. 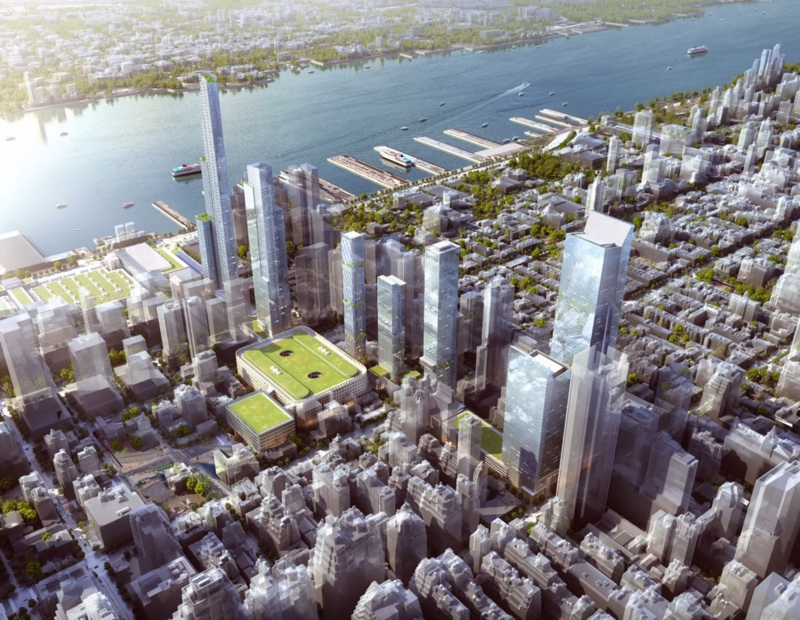 The design features a curving skylight and green-roofed building that connects with Hudson Yards to the west and Times Square to the east. 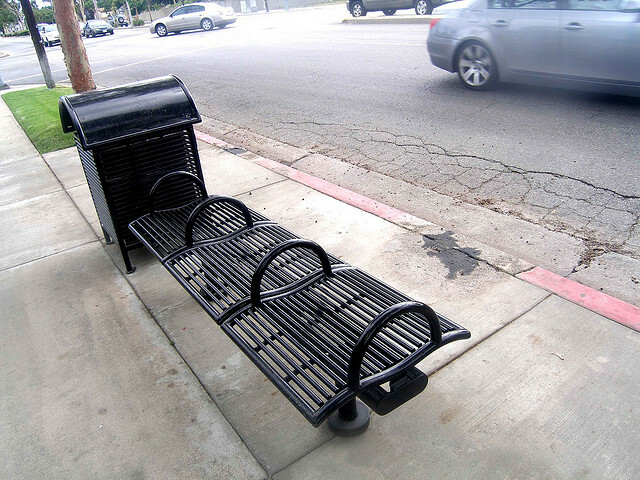 https://www.youtube.com/watch?v=zF2k6D_w-IQ Perkins Eastman's entry, created in collaboration with ARUP and Mikyoung Kim Design, among others, puts the bus terminal on the lowest floor of the Javitz Center to get the buses off the local street network. https://www.youtube.com/watch?v=-DVLqhHNU8o The winning team will receive a one million dollar honorarium. Read more about entry guidelines and submissions criteria here. 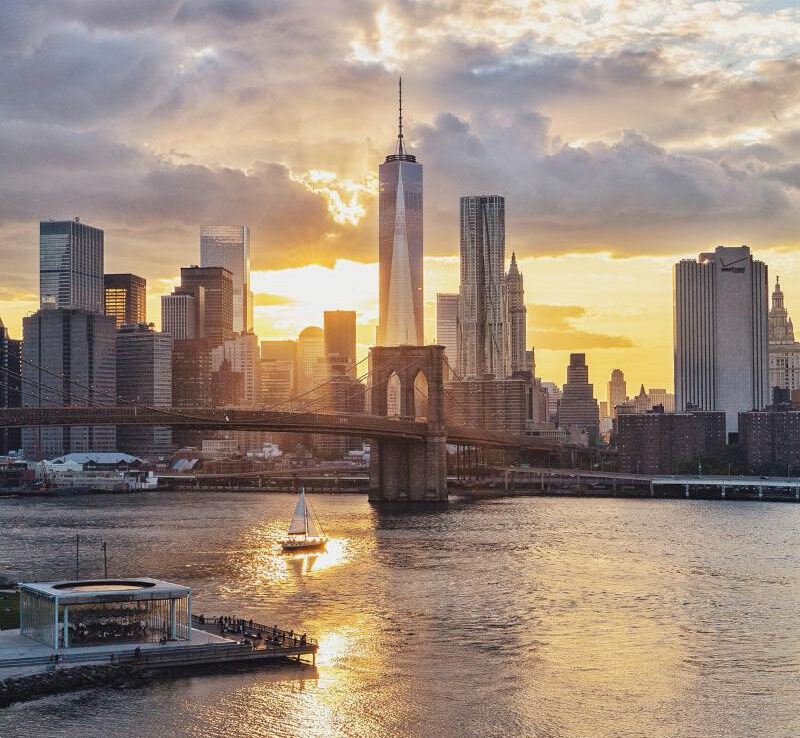 It's hard to think of a New York City building more laden with symbolism than the Freedom Tower, also known as One World Trade Center: The 1,776-foot-tall is a triumphant symbol of life after death, a toast to the city's post-9/11 resilience. For the Port Authority of New York & New Jersey, though, the $3.8 billion building is a financial ball-and-chain. Last year, the Port Authority's revenue on the 3-million-square-foot, SOM-designed Freedom Tower was $13 million, a measly 0.35 percent return on investment, according to the Citizens Budget Commission. The Port Authority wants to sell the Freedom Tower—which could be worth as much as $5 billion—to the highest bidder within 2017. If it goes for that price, the tower will be the most expensive office building ever sold in the U.S., but observers told Crain's that the sale will almost certainly be fraught with complications. In a demonstration of good faith—or xenophobia—the families of 9/11 victims, the agency's own police force, and even the federal government, which maintains U.S. Customs and Border Protection offices in the building, would probably oppose a sale to, say, a Middle Eastern buyer. Because of its symbolism and location, the building is still a terrorist target. One World Trade Center's $121 million annual operating budget includes security, though the Port Authority doesn't make its security spending figures public. A buyer may cut those costs to afford the hefty mortgage, although there are few buyers flush enough to even consider buildings like One World Trade. (Since 2008, there have been only 12 buildings sold for more than $1 billion in New York.) TIAA, CalPERS, and large local real estate firms like Related, Silverstein Properties, and Brookfield Properties are expected to bid on the property, by themselves or in partnership with a foreign entity. Bidders, however, would compete with the Durst Organization, which bought a $100 million stake in the tower six years ago. The building is expected to be fully leased in 2019, at which point Durst would take an ownership stake in the tower. That means Durst gets to be the first to match any bid and would have veto power over any deal before its ownership is fully vested. If there was a buyer within the next two years, Durst would need to be bought out for the transaction to continue. In 2014, the Port Authority declared that it would sell off its real estate holdings to refocus on transportation, its original mission. Given the roadblocks to a sale, though, some officials are urging the agency to wait until the tower is fully leased, which would inject revenue and lead to a higher valuation (it's 70 percent full now). Alternatively, officials say the Port Authority could offload less fraught assets, like Brooklyn's Red Hook container terminal, first. This July 4, New York City can celebrate one nation, indivisible, with Liberty Park and justice for all. The World Trade Center's long-anticipated one-acre Liberty Park is set to open this Wednesday. Designed for the Port Authority by New York–based Joe Brown, a design and planning advisor to AECOM, the $50 million park sits 25 feet above an entrance for security vehicles. Planted with a mini-forest of 50-plus trees, the park will provide a welcome respite from the glare of surrounding skyscrapers for visitors and office workers alike. 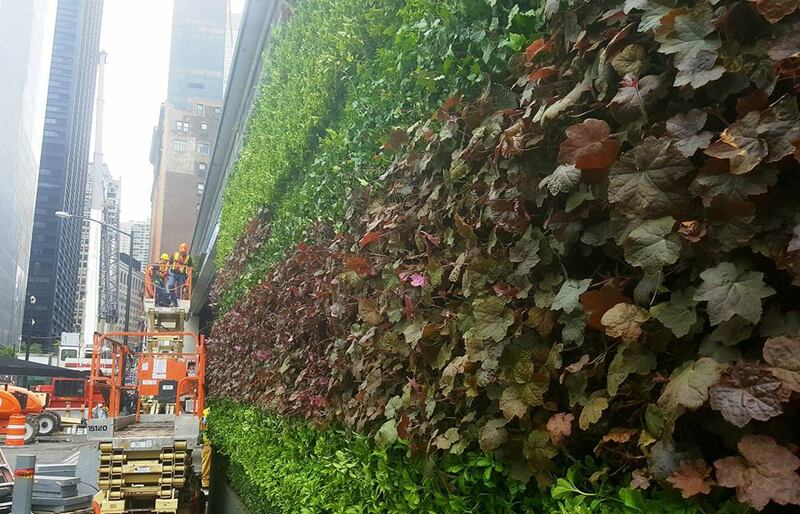 A multihued, 25-by-336-foot-long living wall, designed by Plant Connection, shrouds one side of the security entrance, while angular concrete and recycled teak benches, blessedly free of deterrent barriers, are configured for socializing and sunbathing. An overlook on Liberty Street skates 200 feet along the park's perimeter, affording views of the 9/11 Memorial. Given the setting, loss and repatriation are central themes of the design and programming. A sapling grown from a horsechestnut tree that grew outside of Anne Frank's home in the Netherlands has found its home in the park. Additionally, Douwe Blumberg's 2011 America’s Response Monument (De Oppresso Liber), a sculpture that depicts a Special Forces soldier on horseback who fought the Taliban in the early years of the war in Afghanistan, will be mounted near While most of the green space will open this week, construction will continue on the Santiago Calatrava–designed St. Nicholas National Shrine, a reconstruction of the Greek Orthodox St. Nicholas Church that was destroyed on September 11. For those who'd like an advance look at St. Nicholas 2.0, Calatrava produced an animation of the church's interior and exterior that depicts its relationship to Liberty Park and the WTC memorial across the street. The church is expected to open in late 2018, DNAinfo reports. The park is open to the public year round from 6AM to 11PM. 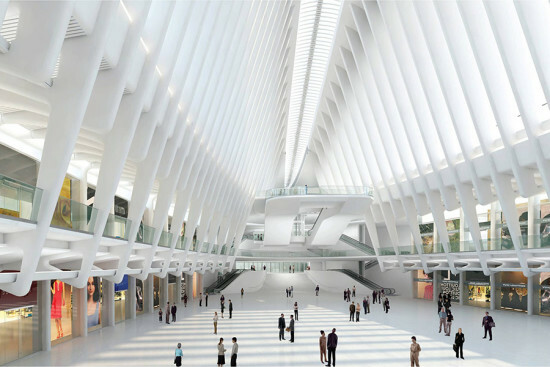 Amidst cost overruns and delays, the Santiago Calatrava–designed Oculus, the visual centerpiece of the $3.7 billion World Trade Center Transportation Hub, has encountered another setback: leaky ceilings. According to the Port Authority, the water comes from the construction of Tower 3 and building crews spraying concrete as they break it up, to reduce dust. The spindly Oculus is a public event space that connects commuters with PATH trains and the subway. The main space is surrounded by two levels of restaurants and retail totaling 635,000 square feet. More than 100 high profile tenants, including Apple, Michael Kors, and Daniel Boulud, have leased space in the building. Barring additional delay, the project should open in the first half of 2016. Though Calatrava bristles when the media points out this project's shortcoming, the architect has had a strong year overall: last month, he was awarded the 2015 European Prize for Architecture. The awards ceremony, coincidentally, will take place at the World Trade Center on November 17. Attendees should bring ponchos, just in case. Over the next 15 years, $7–10 billion dollars will be spent to overhaul one of the saddest, most depressing places on earth. 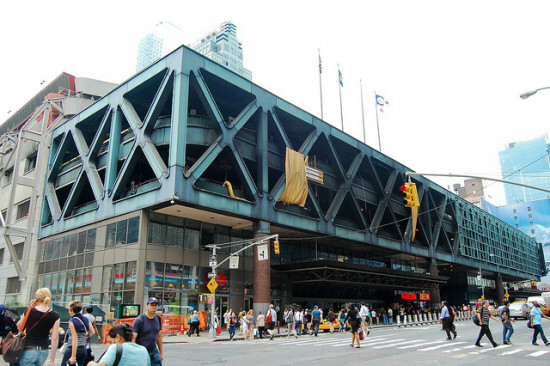 The Port Authority of New York & New Jersey (PANYNJ) voted this month to transform the 65 year old Port Authority Bus Terminal, on Eighth Avenue at 42nd Street, and build a new station on the next block. Earlier this year, the agency estimated it would cost $11 billion to build a new bus station. The new station will be built between Ninth and Tenth Avenues, one block west of the current station. 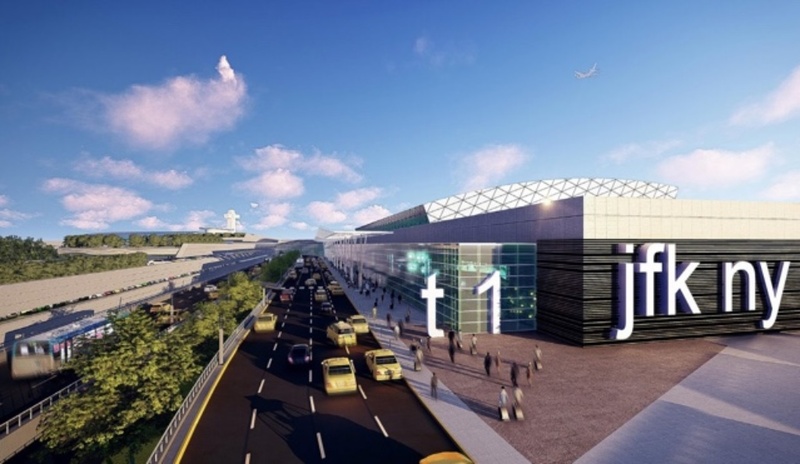 PANYNJ will create a competition to solicit new designs, and the winner will be selected by September of next year. The terminal's 200,000 daily passengers have time to let their excitement built: in a self-study, the Port Authority estimates that it will take between 11 and 15 years to complete the project. Two-thirds of the cost of the new station will be covered by the construction of a tower on the site of the current station, which has 2.3 million square feet of air rights. The terminal is the nation's busiest bus station and a regional transit hub, so it must remain operational while the tower is being built. Bus terminal enthusiasts will recall that, in 2011, PANYNJ scrapped plans to build a 855 foot, 45 story office tower on the site of the terminal, designed by Richard Rodgers. The Port Authority of New York & New Jersey has big plans for Manhattan's West-side bus terminal. In an attempt to cut congestion on the hell-forsaken crowded streets of Hell's Kitchen, the authority is planning a $400 million bus annex a few blocks from the main 42nd Street Bus Terminal. And to improve that hell-forsaken battered terminal, they are reportedly resurrecting plans to build a tower on top of it—the funds from which would be used to improve the facility. The new Galvin Plaza Bus Annex, which would rise on an Authority-owned lot, could accommodate 100 busses and tens of thousands of daily riders. The new space should significantly cut down on travel time by giving busses direct access to the Lincoln Tunnel. As DNAinfo reported, “The proposed facility would allow buses to be parked and ready to go, letting officials feed them into the bus terminal one after another instead of clogging up city streets or looping around the cavernous terminal.” If plans are approved, the annex should be up and running by… 2020. Rome wasn't built in a day. And, according to Capital New York, the Port Authority will release an RFP later this year for a terminal-topping tower. This comes about three years after plans for a 40-story Richard Rogers–designed tower on the site were scrapped. Anticipation was running as high as the tower itself as construction crews were standing by to raise the final two sections of the spire to the top of One World Trade Center today, a move that would have officially made the tower the tallest building in the Western Hemisphere at 1,776 feet, but high winds brought on delays. The final two sections of the 408-foot-tall spire, capped by a shining, pointed beacon, were scheduled to rise this afternoon, but the Port Authority decided to wait for for clearer skies to top-off the tower. The 800-ton spire, once completed, will serve as a television broadcast antenna, while the crystalline beacon, packed with 264 LEDs for a blistering 316,800 lumens, will shine into the sky each night, from sunset to sunrise once everything is up and running. Created by J.R. Clancy, Ballantyne Strong, and TDK Engineering, the beacon will also contain a rotating mirror to reflect different colored lights for the holidays, as we have all come to expect of New York's tallest buildings. The spire has stirred up controversy in the past, as budget cuts that removed an artistic cladding from its design may have downgraded the appendage to an antenna, as opposed to the more lyrical "spire." In the eyes of the Council on Tall Buildings and Urban Habitat, the organization that ranks the world's tallest buildings, this slight change could round down the height of One World Trade to 1,368 feet, leaving Chicago's Willis Tower secure in its position as Tallest in the West. 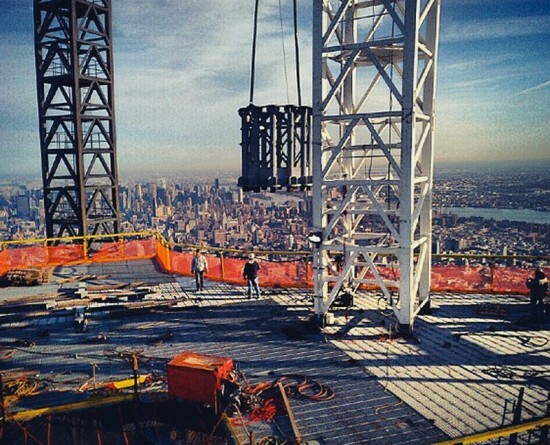 Even if One World Trade doesn't make the grade, the views from the top will still be one of a kind. 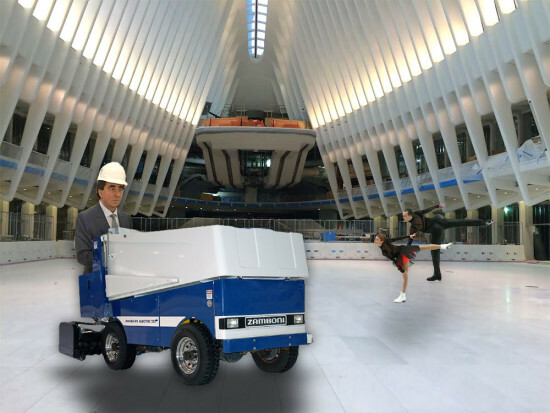 It looks like construction of Santiago Calatrava’s World Trade Center PATH hub won't be wrapping up any time soon. Second Avenue Sagas reported that costs are mounting as the project deadline keeps getting extended. The project could now cost an additional $1.8 billion, and take another 18 months as a result of flooding from Hurricane Sandy, which would mean the station wouldn’t open until 2016. In an interview with The New York Times, Cheryl McKissack Daniel, president and chief executive of McKissack & McKissack, an architecture and construction management company specializing in infrastructure, discussed the cause of the delay. 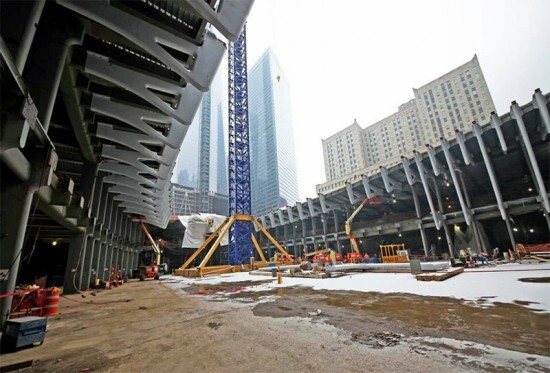 The Port Authority of New York and New Jersey and the Tishman Construction Corporation, however, insist that the transit hub will still be completed by 2015, according to the New York Observer. 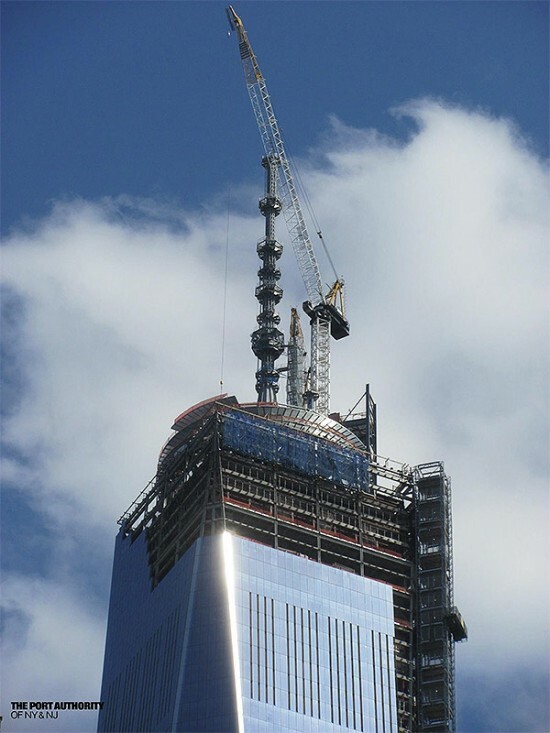 After a 1,500-nautical-mile voyage from Canada, half of the World Trade Center's antenna has arrived in New York, and, this morning, the first segments were hoisted 104 stories—over 1,300 feet above the streets of Lower Manhattan—for installation. During AN's site tour in September, the "roots" of the antenna were clearly visible, ready to accept the structure. Building this antenna is no small effort, either. Like the scale of everything at the World Trade site, the structure is gigantic, measuring in at 408-feet tall, higher than most skyscrapers in the rest of the country. Once finished, the antenna will bring the building's overall height to 1,776 feet. There remains some contention on how to describe the antenna structure—as simply an antenna or, more poetically, a spire—and despite what seems a semantic argument, the results could have tall repercussions. The Port Authority and the Durst Organization—both who use the term spire—opted to remove an architectural cladding designed by SOM and artist Kenneth Snelson from the antenna earlier this year, trimming millions from the building's price tag. Without that sculptural finish, however, the Council on Tall Buildings and Urban Habitat (CTBUH), the organization charged with ranking building heights, could opt to exclude the antenna from the overall building height, where an integrated spire would count. That would mean One World Trade won't clock in as the tallest building in the Western Hemisphere, or even the tallest in New York City.